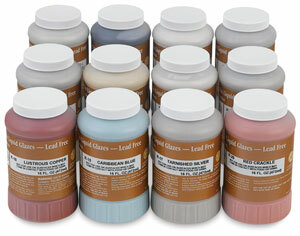 These liquid Raku glazes are lead-free and formulated to create dazzling effects and varied surfaces on non-functional pottery and sculpture. No two finished pieces will ever be the same because the metals and colorants of the glazes are brought to the surface by flame and reduction. This Set of 12 includes one pint of each of Clear Crackle, White Crackle, Blue Bell, Smokey Blue, Smokey Lilac, Caribbean Blue, Copper Patina, Tarnished Silver, Lustrous Copper, Copper Matte, Red Crackle, Yellow Crackle.